My name is Katherine Tyrrell and I live in London. ​- with more than a little success. I'm probably best known for my very successful and very popular art blog Making A Mark. how I can help you - if you want help. ​You can find out more about me on my hub "Making A Mark" website​. This page has a very a brief summary of my other activities at the end. contact me via email (that's an image not a clickable link). Please note if you spam me I will report you to Google as spam. My first degree from Cambridge University is in Education and I'm a qualified teacher. I also have an MBA from the London Business School - voted the #1 Business School in Europe. Analysis is in my DNA! a government inspector of services for the public. Prior to retirement I managed the professional support services (Finance, Human Resources, Estates and information management/technology) for a very large public service with a budget of more than £100 million. Now I do the same - but for artists. This website aims to address many of the issues which I found difficult to find information about when I started to become more serious about my art and wanted to exhibit and sell it. I'm constantly focused on how to help people be better at their art business - and stay the right side of the law! I now find it interesting and get a lot of satisfaction from being able to apply my expertise in financial and business management to help artists - in art schools, art groups, art societies - and just as individuals. I've also mentored a select group of artists on an individual basis - and I now take on people I don't know as clients to work with them on specific aspects of their art business. Until 2015 I moderated the Art Marketing Discussion Group on LinkedIn (until the site owners made changes which killed the effectiveness of Groups on LinkedIn at which point I opted out). I'm also devoting my efforts to this site and hope to make it an important and valuable resource for artists. Would you like me to help? summarises what I do and identifies what I can do for you. This is the new home for all my 'Resources for Artists' sites relating to the art business. 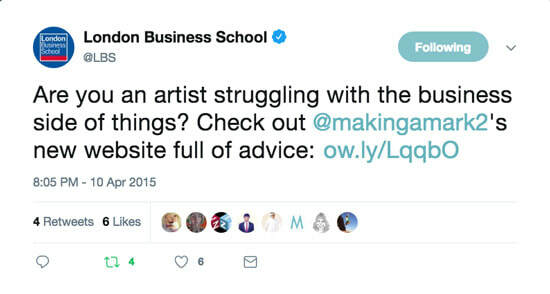 I've regularly highlighted art business issues on my blog 'Making A Mark' - which I've been writing for over 12 years. As I wrote about different art business topics on my blog it occurred to me that it might be useful, for both other artists and me, if I collated what I had written and, more importantly, compiled and organised all the other useful links to information and advice available online in one place. I'm moving content from individual topic sites on article platforms to my own websites. I'm providing updates via the new blog as and when a new content page is published. ​You can see the topics I've be covering by looking at the menus of topics on the home page for each of the main topics in the menu - or check the drop down menus under each item on the menu. well in excess of 50,000 visitors a month. 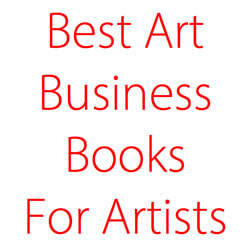 ​Besides reviews of art, artists, art competitions and exhibitions I've consistently covered matters relating to the art business. ​I also write other blogs and am developing other websites and associated Facebook Pages. One of these is now arguably #1 in the world in relation to Botanical Art and Artists. This website now attracts monthly traffic of c.35,000 visitors and over 50,000 pageviews. 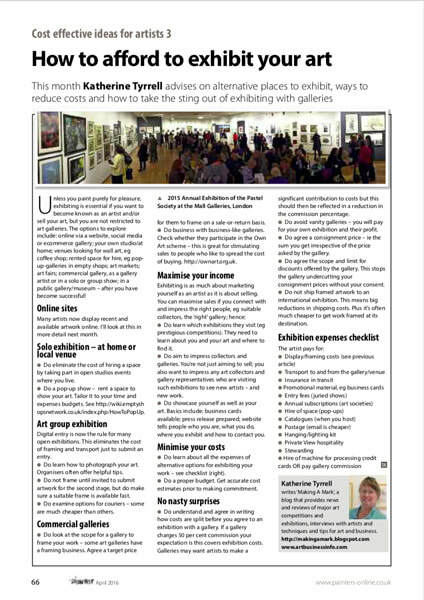 I've written a number of articles for artists' magazines and publications. In June 2018, an article of mine with be published in Occasional Papers of the RHS Lindley Library. READ a more in-depth version on my NEW PAGE Want to know more? Would you like me to help? I am invited/commissioned to give talks to groups about art business matters - including websites and social media for artists. 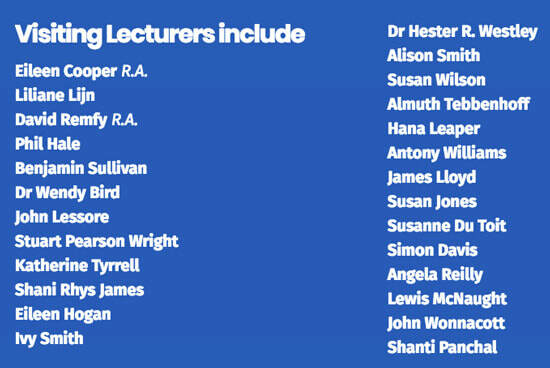 Previous clients include the Heatherley School of Art (where I am a Visiting Lecturer); Cockpit Arts, Mall Galleries, and art societies. At Heatherleys we recognise how important it is that our students receive quality professional development advice alongside their studio practice. 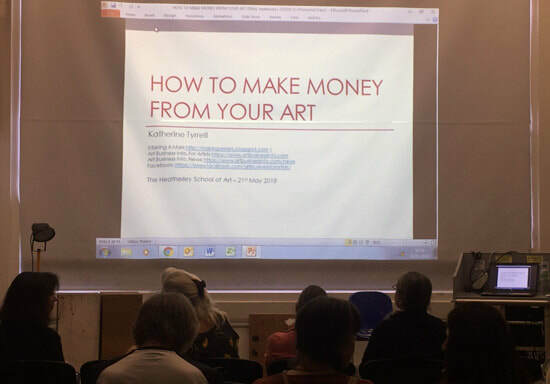 To this end Katherine has provided us with an ongoing series of lectures covering everything from how to write an artist’s statement to how to pay your tax. This has been an invaluable resource for our students, and a rare one as few colleges offer this type of programme. The talks are always very well attended and manage to be both informative and entertaining. WOULD YOU LIKE AN ARTICLE FOR YOUR JOURNAL...? You can ask me to write an article for you. Fees vary depending on topic, journal and how long. Review you artist statement / biography / CV - I don't write it for you. I review, make suggestions and edit to indicate the potential to make your statement clearer. Fees depend on what's required and how successful you are. Review your website and/or blog - I can highlight what sort of impression it creates, what omissions you need to correct and how you can improve how people view you as an artist.